Showing results for "Swarowski crystals"
PRICE REDUCED........ Bright Eyes Reading Glasses +2.50 power...... bronze wire rim arms, Swarowski Crystals, new with tag on glass, case is a soft velour color that is a deep eggplant/purple color. 5 outside...approx 1 wide arm is 5 1/2 long stylish designer glasses.....you will get many compliments with these.....ask any questions QUALITY READING GLASSES WITH CASE..
eBay GORGEOUS! 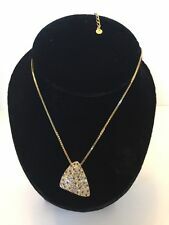 Gold Plated With Swarowski Crystals Necklace looks NEW 18,5"
eBay pink and swarowski crystals doll or bear top shirt outfit.